"Only a fool is sure of anything; a wise man keeps on guessing." 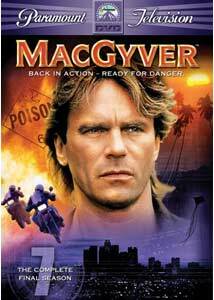 MacGyver aired for seven seasons on ABC and delivered 139 action-packed episodes prior to its cancellation in 1992. Two full-length television movies followed in 1994 to give the show's devoted fans a few more stories. Richard Dean Anderson (Stargate SG-1) stars as the ingenious jack-of-all-trades MacGyver, who can use nearly any common item to escape from a dire situation. For example, in the episode Obsessed, our hero uses a household cleaner to burn out a light and distract a bad guy. This silly tactic is one of MacGyver's simpler actions, which often stretch the limits of science to the furthest degree. Bart: What's a MacGyver, and why does it have a convention? Patty: MacGyver was a show about a secret agent who used inventions made of everyday objects to defeat bad guys. Selma: And he was played by the three greatest names in the history of television. Richard. Dean. Anderson. By the start of its seventh season, the series formula was growing a little stale, with the weaker stories feeling a bit too familiar. Honest Abe begins the year in clunky fashion due to sub-par supporting performances from Shelly Berman as a lying CIA operative, Ben Stein as an unemotional major, and Time Winters as a caricature of a French villain. Its only saving grace is MacGyver's inventive use of morse code to control a high-tech chopper. Anderson still gives a good performance, but the unconvincing minor players bring down the material. This trend occurs frequently throughout the season. One interesting but particularly dull entry is The Coltons�the failed pilot for a possible spin-off about a family of bounty hunters. MacGyver makes a quick cameo appearance, but the story is driven by the uninspiring Coltons, who include Della Reese and a young Cuban Gooding, Jr. The seventh season does contain some worthy episodes, beginning with Obsession, which features the final appearance of Michael Des Barres as the elusive assassin Murdoc. He apparently died in a past encounter, but bad dreams and strange phone calls lead MacGyver to believe that the killer still lives. The villain receives limited screen time, but Anderson shines while conveying the frustrating situation. The collection's most notable inclusion is Good Knight MacGyver�a two-part journey into Arthurian times spawned by a hard blow the hero's head. Is it a hallucination, or has he actually journeyed back time? The end result is pretty hokey, but it does finally reveal MacGyver's mysterious first name. The series concludes with The Stringer, which introduces a young man named Sam who claims to be MacGyver's son. The plot involving Chinese slave trade is mediocre, but the emotional moments between the father and son are effective. Ending with sincere thanks from Richard Dean Anderson, the show gives the likable character a fitting goodbye. MacGyver's legacy has transcended the television show and made his name well-known more than 10 years after his final appearance. Even people who never viewed the show think about his ingenious creations with gum, duct tape, and other odd items when the name appears. Anderson spoofed the role earlier this year during an American Express commercial that depicted him utilizing his trademark ingenuity. A fake MacGyver presidential campaign website for 2008 also exists to poke more fun at the idealistic character. These aspects enhance his mystique, but they do not always translate into classic television. The seventh season provides an uneven collection of 14 episodes, but even the lesser stories offer minor entertainment. Considering the smaller number of entries, the omission of the two movies has angered some fans, but I expect they will still enjoy this bare-bones release. Image Transfer Review: MacGyver: The Complete Final Season includes the original full-frame transfer and offers few improvements over the television picture. The grain levels are pretty high, and the colors are missing the sharpness of remastered transfers. These flaws are partially due to the limited source material, but it is still disappointing to see the minimal time spent on improving the image quality. Audio Transfer Review: This release includes an acceptable 2.0-channel Dolby Surround track that presents the upbeat music and effects solidly. However, limited complexity exists, which makes the transfer sound a bit too similar to the standard television audio. This is not a surprising element, but it does make for only an average listening experience. Extras Review: This collection includes no extra features besides the two preview trailers. I would have enjoyed at least a short interview with Richard Dean Anderson or the creators about the series' legacy. A commentary track for the finale also would have been worthwhile. Unfortunately, Paramount follows the past releases' trend and has provided a bare-bones set. MacGyver: The Complete Final Season includes some major clunkers, but it retains the show's light-hearted nature and should please its devoted fans. The omission of the two television movies is a disappointment, but I expect Paramount to offer them as a separate release on a future date. Considering the reasonable list price, this collection receives a mild recommendation.